Monday was an exciting day for me. 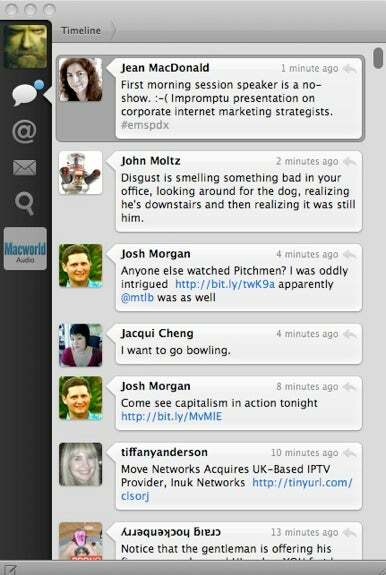 Tweetie for Mac was released, bringing atebits' popular iPhone Twitter app to the Mac. It may seem a little silly to be excited about the release of a Twitter app, but if you're on a Mac and using Twitter, you were probably excited too. I haven't been on Twitter since the beginning like some of my friends, but I do enjoy following people and interacting with them. It's a very interesting phenomenon—people post about whatever they happen to be doing or thinking to those who follow them, and you respond if you want to. I've seen some very intelligent debates on Twitter and I've seen some really stupid things being argued about. It's kind of like sitting at your local coffee shop and chiming in on whatever conversation strikes your fancy. For the time I've been on Twitter, I've used Twitterrific. A good quality app for sure, but it just wasn't fulfilling all of my needs. I tried several of the alternatives, but always ended up coming back to Twitterific. Macworld recently launched the Macworld Audio Twitter feed as a way for me to communicate with all of our music creation readers—a nice two-way street. The only problem I had was that Twitterrific only supports checking one account at a time. My solution was to check my personal account with Twitterrific and the Macworld Audio account with Tweetie on my iPhone. With the release of Tweetie, I can now check multiple accounts in one application. That was enough to make me jump for joy, but it had more to offer than just that. Tweetie has a solid interface that is easy to use and understand after only a couple of minutes of using the application. Your accounts are listed down the side and you have Timeline, Replies, Direct Messages, and Search buttons for each account. When a new message comes in, you simple click on the account or the appropriate button to read the new tweets. Tweetie also has plenty of key commands, so you can navigate the app, post, and reply without having to use your mouse much of the time. I also love that Tweetie can automatically shorten URLs, so you can post links and have the app look after the tedious task. I'm glad to see the iPhone is spawning new applications for Mac. Until now, it has been the other way around, so this is a refreshing change. Tweetie costs $15 or is available free in an ad-supported version. I would highly recommend giving Tweetie a try—you won't regret it.